I thought another postcard series would be fun and I hope you'll join in. 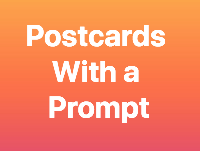 This one's called Postcards With A Prompt and each week, there will be a different topic or question to write about on the back of a postcard. You can decorate the back or include a quote, lyrics, etc...as long as you address the weekly prompt. Sign-ups will go through Saturday. Partners assigned on Sunday and cards mailed by the following Saturday. Thanks for rating promptly! This week, Prompt #10: What would you do with an extra hour every day?